Boyds Teddy Bears - Welcome to my sales page. I must admit I have a bit of a soft spot for Boyds bears, there is something about the way they feel in your hand when you hold them. You can feel the quality and care that has been taken to make them and their sweet little faces always make me smile. So if you like me like to collect Boyds bears and enjoy their whimsical styles then I hope you find something to your liking here on my sales page. Note to UK buyers, Boyds are no longer supplying the UK with new bears. Description: First produced in Oct 2004 this bear is now retired from the Boyds collection. 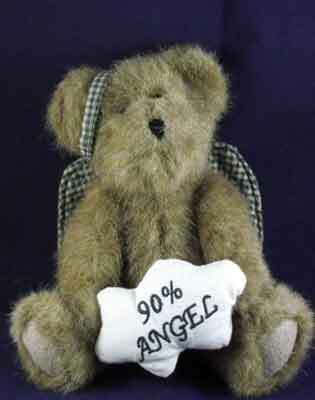 Lil Dicken is a very sweet bear who wears a pair of green plaid wings and holds a little white cloud with the words "90% angel". Description: Corky First produced April 2004, this bear is now retired from the Boyds collection. Corky is part of the Razz Bearies Collection. He is a pure white colour and sports a black and white Bow around the neck and has black and white spotted paw pads. Corky is full of fun and likes a glass of wine now and again, which is obvious from the soft wine bottle he is holding which reads " Wine is my favourite four letter word...". 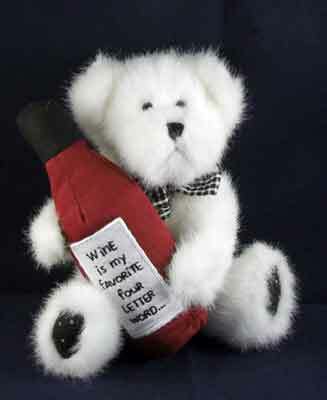 Corky would make a great gift for the wine lover in your life. Or add that splash of brightness amongst your other Boyds bears.